Tucked away in the quiet maze of historical streets between the Plaza Mayor and the Royal Palace in Madrid is a fun inventive restaurant that I love to visit for special occasions and entertaining visiting friends. With climatized glass wine case and warm brick walls Taberneros is a harmonious mix of modern and the traditional. This theme is also reflected in the culinary creations you will be served. Some Spanish classics are available such as the salmorejo cordoba. In Cordoba, gazpacho is traditionally reduced to a basic sauce-like consistency and served as either as a dip or a soup called salmorejo. This dish is served in small portions and dressed with chopped hard-boiled egg and julienne strips of cured ham. Beyond such traditional Spanish dishes, Taberneros also serves an array of Mediterranean dishes influenced by French, Italian and even Japanese cuisine. The inventive menu changes with the season and if you are not sure what to order the attentive and helpful waitstaff will help guide you. Although tapas are on the menu this is not a typical tapas bar, as it is meant for sit-down meals. There is a small bar located in the back where you can sip on a glass of wine and partake in a small tapa; however, the bar may be full with patrons waiting for one of the available twelve tables. Though the eating is limited, the high ceilings and low lights give the space an open yet intimate feel, allowing you to sit back and enjoy the ambiance. The multi-page wine list not only has a good representation of Spanish wine, they also offer wines from other, mainly European, countries. A sommelier is on staff to help you choose the perfect match for your food. 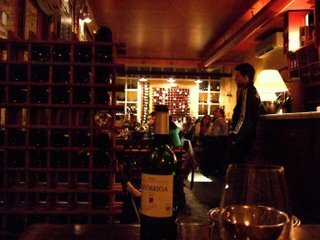 The bill with an average priced wine comes to about 25 to 35 euros per person and is an excellent price to quality ratio. For reservations: 91 542 21 60, however, Friday and Saturday evenings are on a first-come, first-served, basis. Address: Calle Santiago, 9. Madrid, Spain. Mash garlic to a paste with salt using a mortar and pestle (or mince and mash with a large knife). Blend garlic paste, bread, and almonds in a food processor until nuts are very finely chopped. Add oil in a slow stream with motor running, blending until thick and smooth. Add tomatoes and 2 tablespoons vinegar and blend until as smooth as possible, about 1 minute. Force soup through a sieve into a bowl, pressing firmly on solids. Discard solids. Transfer to a glass container and chill, covered, until cold, about 3 hours. Season with salt and vinegar, then serve in small bowls, topped with egg and ham. Gazpacho can be chilled up to 2 days.